Welcome to a new edition of the Neon Jazz interview series with Jazz Drummer Brandon Goodwin of the Canadian Jazz Collective B’s Bees .. The band is a hard swinging jazz outfit known for writing compelling original music and playing high energy interpretations of the music of past masters such as The Jazz Messengers, Thelonious Monk and Charlie Haden. They are made up of 4 core members and several charter members that started their world together after they won over their audience at the debut concert at the Montreal International Jazz Festival in 2012. 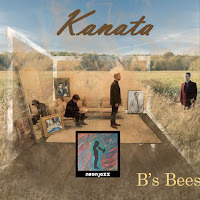 These days they are promoting their latest 2018 CD – Kanata ..